Fortunately for us, people are constantly in search of additional ways for artists to creatively express themselves. One such person is artist, actor, director, and writer, John Knauss. In 2017, John noticed various types of paper were being used in the fashion industry. Mr. Knauss felt if paper was going to be used, people should be encouraged to write and draw on it; such was not the case. So, he took it upon himself to design a product that would not only be fashionable, but practical....enter the DrawBag. John recently took some time to speak with us about DrawBag, and why he feels it has a very important place in the artistic world. Take a few minutes to learn more about this innovator, and his incredibly unique product. I want to start off by saying thank you for creating the DrawBag. It is an awesome product, and it's great to see how creative people have been with what you've designed! Thanks, and you're welcome. Yeah, it's very cool to see people express themselves in a new way through something you've created. For those who may be unfamiliar with you, please tell us a little about yourself. I'm from the east coast of the US, but have really lived around the country and abroad for most of my life. I studied as a visual artist at Wheaton College, outside of Chicago. Then, I later received my MFA in Acting from the Professional Theatre Training Program at the University of Delaware. Later, I received a Secondary Diploma of Education while heading the Creative Arts Department of a private school in Sydney, Australia. Aside from all that nonsense, I've been a writer, director, designer, and technician, mostly in and around live theatre. I taught these things for about nine years as a career teacher, and then in the past year and half, I started my own business, which is the DrawBag. That's my full-time focus now. When you first had the concept for The DrawBag, what goals did you have in mind for it? 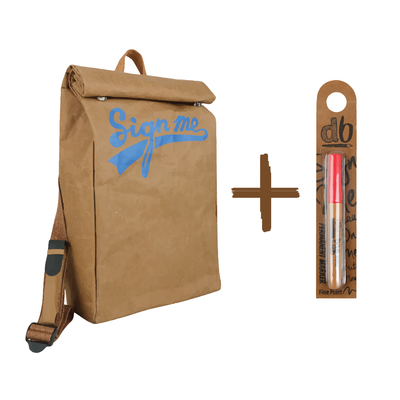 The first concept I had for the DrawBag was actually what later became the "Signature DrawBag", which was aimed primarily at high school students during graduation time. I wanted to make a paper bag with an attached marker for students to collect signatures and messages with during the last weeks of school which could then later become a natural archive (or time capsule) for their high school memorabilia. 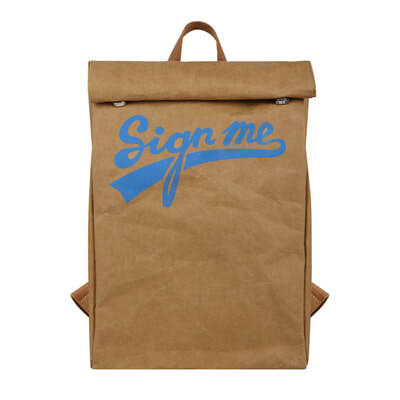 This concept was really built more around the written word than image-making, and the memories that would become sort of embedded in the physical bag similar to a yearbook or a celebrity signing your t-shirt. 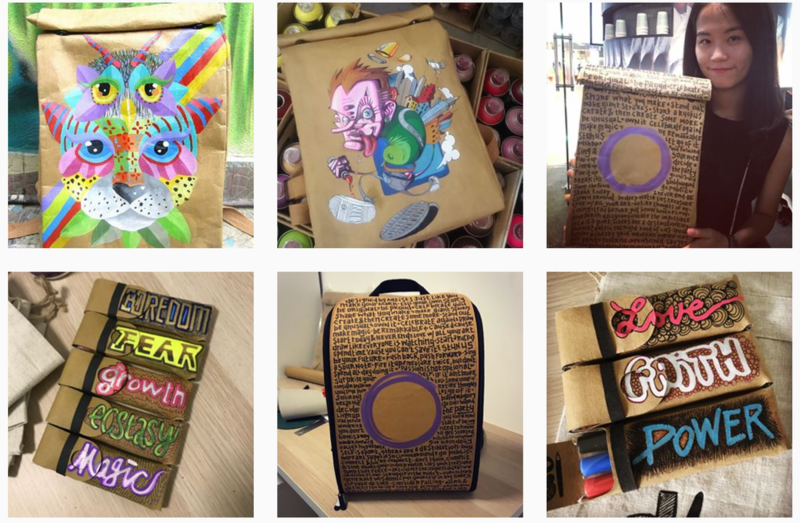 The idea of a bag and an online community for broader artistic expression actually came some time later. How did you first learn about kraft paper and the materials that eventually were used to make The DrawBag? Kraft paper is one of those things you've probably seen all your life in some form, but never really thought about, whether in deli meat wrapping, or a bag of concrete mix. Around 2017, I saw it appear in fashion bags at the Canton Fair in Guangzhou, China, and that's where the idea of the DrawBag came from. After seeing it, I did some research into the material itself... its history, characteristics, and its production in Europe. It's really fantastic stuff, and there's more that can be done with it. Product innovation can be driven by a number of things, including recombining existing things in a new or better way (like the iPhone did in 2007) or with the emergence of new materials or processes. I think kraft paper is going to be something we will see used in many varied applications in the years to come, so go ahead and start imagining your own uses for it now! How was the initial response to your concept, compared to how well the bag is now being received? The response has always had this dual-nature to it because people respond to it being both a paper bag (which is still quite novel in itself), as well as it being this thing specifically encouraged to be drawn on and shared. Some people initially just latched on to the product, meaning they focused on its paper bag-ness and wanted to know if it could be bigger, smaller, in the form of a messenger bag, with different straps, etc. And then, there were the people who got the deeper concept that the brand was not just about selling a paper bag, but was about encouraging self-expression, sharing, building a global artistic community and all the other stuff that can only grow with time, voluntarily, communally, and in many ways, apart from my control. So, the reception has always had several layers to it, but that second nature of the response has grown deeper and more vibrant as the product line begins to expand and that community (or tribe) grows. Just wait for some of the things yet to come! The answer to this may change daily, but what's your favorite thing about the DrawBag? I gotta say first that launching your own brand is a bit like a marriage (I'm imagining) in that you're 24-7 around the thing, and no matter how much you love it, you tend to lose some perspective from time to time, and even end up questioning whether you were crazy to have committed yourself to it in the first place. But yeah, you're right, it does change almost daily in that when I see an image of a new bag in the hands of an artist, or a kid somewhere doing their creative thing, I have my new favorite bag... again and again. As you see consumers share their art on social media, how does it make you feel to know you are partially responsible for what they were able to come up with, and how they were able to express themselves? Yeah, it's pretty thrilling and honestly, kind of humbling. I consider any form of human expression a really special, even sacred thing, and if I can have helped a child be inspired to draw with real pride and joy, and then share that by wearing their artwork around on a DrawBag, or if I can help an artist get more of their work out in a unique format (and help them get paid by others for it), or any number of things that again, the brand itself is really on about, I'm moved. I guess it's one thing to design a product you feel very proud about in that it's YOUR design that people are buying and appreciating, but it's something completely different when that YOUR THING-ness of it actually is subsumed by the experiences people are having in designing it themselves and it's really becoming more about them. Either way, people's lives are enriched, but that added layer of interactivity and enablement is something I think I'm always pursuing in my work. Seeing how well things are going, where do you see DrawBag going in the future? We launched in late 2017, so The DrawBag is really still in its very early stages. That interactive, or organic nature of the brand's growth I referred to, means that new product designs, collaborations, and applications are coming about in relation to its own growing tribe. In other words... I'm not so much producing things I want, but I'm trying to produce things I think our particular customers and partners and collaborators would be into. Of course, the brand is grounded and steered by this quality of encouraging self-expression, connection, and memory-making and that won't fundamentally change... but beyond that there is alot of room for things to evolve unexpectedly in the life of the brand, if that makes sense. If I were just making generic paper fashion bags, that would all be different. But the DrawBag is fairly niche. It's not for everyone, and as those new designs come out, it will get even more niche in certain respects. To give a specific example, one of the next versions of the DrawBag to come out will be what is right now called "The ColorBag." It's a DrawBag that will be something like a wearable, adult coloring book which is printed with different patterns and designs in black ink. For those who really dig the idea of the DrawBag but don't feel confident enough to draw themselves, or just simply enjoy coloring... this version is really for them. And the designs printed on each bag will be in limited runs, created through collaboration by two artists for each design, all from around the world, who are intimately linked to the brand initially through working on the One World Artist Gallery project that you can see on the official website. So we don't have a corporate design team or anything. We work with artists around the work in a more organic way to produce new stuff, which I think is much more personal and rewarding on many levels. That sounds awesome! Here on GlobalGeniusSociety.com, we consider everyone to be a creative genius. With that in mind, we always ask, "What's your creative genius?" In other words, what makes you different, what makes you stand out in your field? I think my real genius lies in being a creative director. I understand and have some competence, or even mastery in a number of different artistic areas, but I really prefer enabling others who are exceptional and passionate in their own fields, work together as part of a team in service of an overall vision that I can inspire passion for. I've always enjoyed this. The key to throwing a great party is in inviting the right guests, and that's the same for casting a show or building a company, I think. I like putting disparate pieces together into a completely new whole, and that makes sense if you think about how the DrawBag came about as a concept. And all of this is in service of thrilling and inspiring an audience... and perhaps on a deeper level still (when I'm operating at my best) awakening a certain level of consciousness. Thanks for taking the time to speak with us, John!